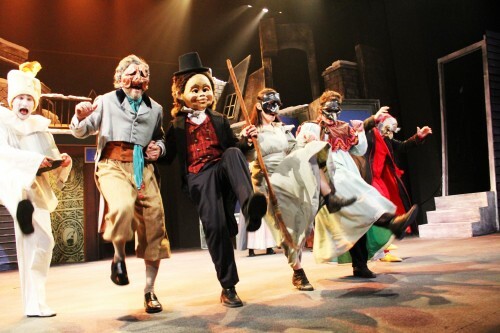 Production photo from A Commedia Christmas Carol in 2012, photo by Second Glance Photography. If the shops have all started their pre-xmas decoration and planning why shouldn’t you? Not the decorating part – that’s borderline criminal to do before turkey day. But some planning is in order, as tickets – unlike tacky tinsel – are a finite resource. In D.C. theater the end of the year means it’s A Christmas Carol time. There’s three I’m aware of that you can choose from and they’re either here or about to open. Here’s the rundown on your choices. The every-year annual appearance is, of course, Ford’s Theater’s offering. This article actually arrives a bit late by Ford’s standard – their first show was last night, November 21st. How you could possibly be in the mood for this show that early is beyond me, but if you started humming along with Frosty several weeks ago then maybe you’re game. You’ll have to wait a week till November 29th for the next opening, Faction of Fools’ A Commedia Christmas Carol. I saw and reviewed this show last year and can recommend it. Four shows will be sign language interpreted – check the list on the bottom – and there’s a pay-what-you-can offering on November 30th. So if you need something affordable to break up the day on Saturday when your family has really started to make you nuts, there you go – hie on over to Gallaudet’s campus for the show at 2p and take them to Union Market for an early dinner afterwards. 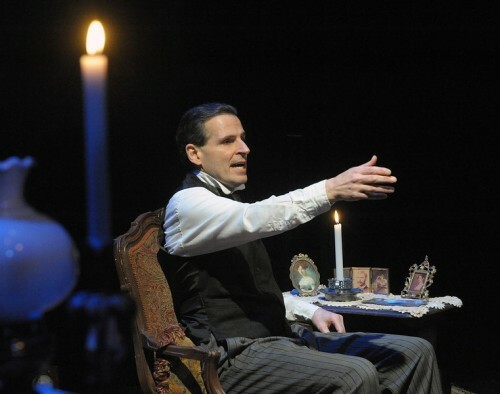 Paul Morella in ‘A Christmas Carol: A Ghost Story of Christmas.” Photo by Stan Barouh. Also opening on the 29th is Paul Morella’s one man production of A Christmas Carol: A Ghost Story of Christmas at Olney Theater. I saw this last year but didn’t get a chance to review it – the first thing I ever blamed on That Darned Baby, whose surprise arrival cut into my writing time. So I’ll tell you here: it’s well worth the sometimes infinite-seeming drive to Olney. Morella manages to control the stage – such as it is in the black box that is the theater lab at Olney – and makes you and your 149 seat mates feel like you’re just a half-dozen folks sitting on the floor, listening to the tale of Scrooge’s last chance to reform. A Commedia Christmas Carol runs November 29 through Sunday, December 22, 2013 and is at the Elstad Auditorium at Gallaudet University, 800 Florida Ave NE. Free parking is available and the closest metro stop is NoMa-Gallaudet U. A Christmas Carol at Ford’s Theater runs November 21, 2013 through January 1, 2014, 511 Tenth St, NW, Washington, DC 20004. Metro Center is marginally the closest stop of the four stations (Federal Triangle, Gallery Place/Chinatown, Archives) that box the theater. A Christmas Carol: A Ghost Story of Christmas at Olney Theater runs November 29 through December 29, 2001 Olney-Sandy Spring Road, Olney, MD 20832. The closest metro stop is you must be kidding. It’s about a 30 minute drive but there is the possibility of bussing it, though it’s not a minor time commitment.